The markup on Republican Congresswoman Michele Bachmann’s bill to do an end-run around the Wild & Scenic Rivers Act in order to build her Boondoggle Bridge across the St. Croix River is Wednesday, October 5, in the House Natural Resources Committee. Bachmann’s bill, H.R. 850, is one of about 20 bills the committee is expected to deal with at Wednesday’s meeting, which begins at 9 a.m. CST. It will be streaming live online at the committee’s website. Minnesota Democratic Sen. Amy Klobuchar has introduced a Senate version of Bachmann's bill, S.1134, that was heard in the Senate Committee on Energy and Natural Resources Subcommittee on National Parks July 28. You can use this form to send the committee your comments on Bachmann’s legislation. For some ideas on where else in Minnesota we could spend $360 million on bridge repair and replacement rather than this Bridge to Nowhere, you can start with this recent report. To discuss the issue of the precedent this bridge would set for other rivers protected under the Wild & Scenic Rivers Act, check out this past article. 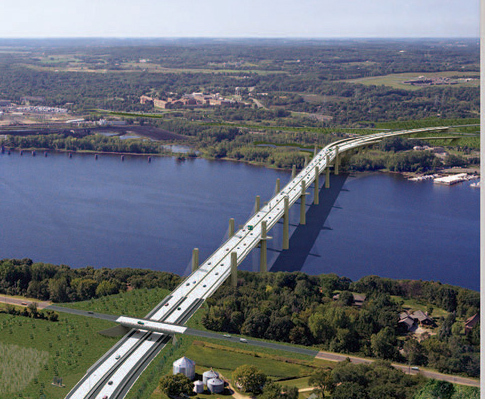 For background on one no-cost option the city of Stillwater and Minnesota department of transportation have so far ignored--reducing the frequency of the bridge's lift--read this. Jim Erkel of the Minnesota Center for Environmental Advocacy gave an excellent presentation at a recent forum on the proposed Stillwater bridge. You can view it here. For details on a more sensible bridge proposal that costs hundreds of millions of dollars less and significantly less in environmental impact, go here. Please send your comments to members of the House Natural Resources Committee before Wednesday. Tell them this bridge is an environmental and economic disaster that will result in a horrible precedent for the development of other protected rivers nationwide. Tell them there are far more sensible bridge solutions to crossing a protected scenic riverway than with a $680 million, 65-mph freeway bridge just 6 miles from an existing eight-lane freeway bridge. Tell them this is the wrong bridge at the wrong time. So Democrats like governor Mark Dayton and Senator Amy Klobuchar are saying quit stalling and build this bridge, but you are trying to make it a partisan issue? You people have no shame. It is very difficult for the neutral observer to understand how the aesthetics of the river would be enhanced by deliberately crippling the vehicle traffic that flows across it. "Bridge to Nowhere"? If it goes nowhere, why is it used every day by thousands of people? Thanks for the linke to the NHRC. I sent a note asking for approval of this necessary and overdue bridge.